For our January/February Kitchen Issue, we asked local home and design professionals about two-tone kitchen cabinetry. Photography courtesy of William Ohs and available through Glen Alspaugh Kitchens and Baths. “I really like this look! I think the mix of finishes on kitchen cabinetry will become a classic–many people are entertaining in the kitchen and like the furniture and homey feel that this style delivers. It looks less matched and more gradually put together than when all cabinets, counters, etc. are all the same.” Patrice Munden, Patrice Munden Interior Design. 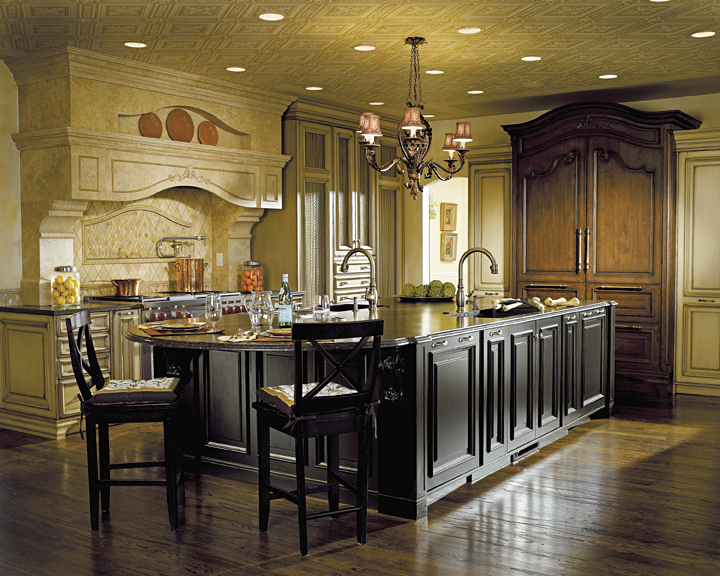 “In my opinion, I feel that a kitchen island in a different color from the surrounding cabinetry has become a classic. Very simply, the large island is the anchor of the kitchen and, as such, should be in a different color that complements the rest of the kitchen yet stands alone.” Tom Manche, Tom Manche Interiors LLC. “Classic. Cabinets that don't match hark back to an era when built-in cabinets didn't exist. The kitchen was filled with freestanding pieces of furniture that had different functions. The term kitchen cabinet meant a freestanding piece that had a countertop with doors below for storage and shelves or doors above the counter. It was all one piece of furniture. All of these pieces weren't purchased together as a matched set, so mismatched cabinets have been around for a long time. ” Marcia Moore, Marcia Moore Design. “Craze. Our office thinks it is a little disconnected. Designers will think of something else so we can sell more product!” Jeannie Brendel, Brendel Architects, LLC. “I believe two-tone kitchen cabinetry is a craze, although I do like it. I feel it is the industry’s way of doing something different and inspiring the public to redo their kitchen and try something new. I feel that is a good thing to be unique, but classic is not unique. It has been around a long time, and it is also beautiful. There are many ways to design a kitchen depending on what the client wants.” Jane Ganz, ASID, Directions in Design, Inc.